John Berggruen Gallery is pleased to present an exhibition of recent work by Robert Kelly. Robert Kelly: New Paintings will be on view between November 6 and December 6, 2014. John Berggruen Gallery will host a reception for the artist on Thursday, November 6, 2014 between 5:30 and 7:30 p.m. to coincide with the San Francisco Art Dealers Association’s First Thursdays. Robert Kelly: New Paintings is Kelly’s fifth solo exhibition at John Berggruen Gallery and features eleven paintings from his recent body of work. Kelly’s work conveys a vested interest in a clean, formalist aesthetic. A few paintings from the exhibition––Invisible Cities, Camargo’s Fold, and Red Fold I––affirm an affinity between Kelly’s work and the Brazilian 1960’s Neo-Concretist movement, including artists Lydia Clark, Helio Oiticica and Sergio Camargo. Kelly’s process involves a complex sequence of layering and building up the surface of the canvas through the application of various paint and paper materials, including archival newsprint, vintage posters, and other printed ephemera collected by the artist during his travels throughout the United States, Europe, North Africa, the Near East, and Nepal. The use of such materials references what Kelly calls the “historical present.” Glazed over and polished to an alabaster sheen, these original layers of material act as a guide to Kelly who then buries them beneath subsequent layers of high gloss colored pigment. These large blocks of juxtaposed color emphasize the weight, authority, and sensual quality of the materiality of paint. Kelly’s paintings have been likened to palimpsests, that is, though very nearly erased and their beauty obscured, traces of the original are allowed to persist. With mathematical precision and close attention to form, Kelly continually edits and refines a painting, reassembling the pieces to ultimately achieve a final composition that is a perfectly balanced, harmonious whole. A number of paintings in the exhibition come from Kelly’s body of work titled My Brother, Myself. The artist, a fraternal twin, is inspired by issues of sameness and similarity, but not exactness. 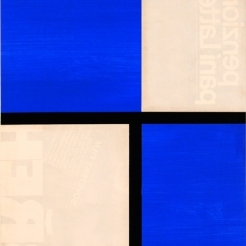 In Kelly’s paintings, the double-play of colored bars and squares aligned accordingly, in similar but not exacting ways, is a direct example of his investigation of this theme. Through the manipulation and exchange of figure ground relationships––color contrasted against the ivory and bone tones of the paper––the artist continues to explore the oscillation between apparent contrast and the illusion of sameness. Furthermore, the artist remarks upon the uncanny ability of the printed type layered subtly, hauntingly beneath the surface of colored, geometric forms to evoke the “intimacies of another time hovering in the background.” These phantom forms of Czech type expand upon issues of memory and the role it plays in the development of the ongoing relationship between Kelly and his brother, Thomas. Robert Kelly (b. 1956) was born in Santa Fe, New Mexico. He received his Bachelor of Arts degree from Harvard University in 1978. Before devoting himself entirely to painting in 1982, Kelly worked as a commercial photographer for such publications as Life Magazine. In addition to his inclusion in many private collections, including that of Werner Kramarsky in New York, Kelly’s work is represented in a number of museums, such as The Whitney Museum of American Art, New York; The Brooklyn Museum, NY; The Museum of Fine Arts, Santa Fe, NM; the University of New Mexico Art Museum, Albuquerque, NM; The Fogg Art Museum, Cambridge, MA; the Smith College Art Museum, Northampton, MA; the Milwaukee Art Museum, WI; the Jane Voorhees Zimmerli Art Museum at Rutger’s University, New Brunswick, NJ; the McNay Museum of Art, San Antonio, TX; and the Margulies Collection, Miami, FL. Kelly currently lives and works in New York City. For further information and photographs, please contact the gallery at 415.781.4629 or info@berggruen.com.